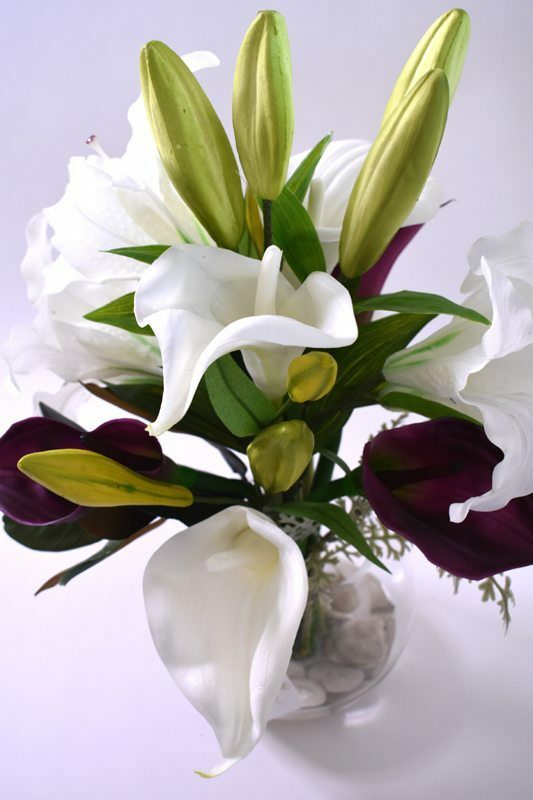 Mix of Real Touch White Casablanca Tiger Lilies, Dark Purple and White Calla Lilies, Dusty Miller, Buds and Magnolia Leaves in a large fishbowl vase permanently set in artificial water. 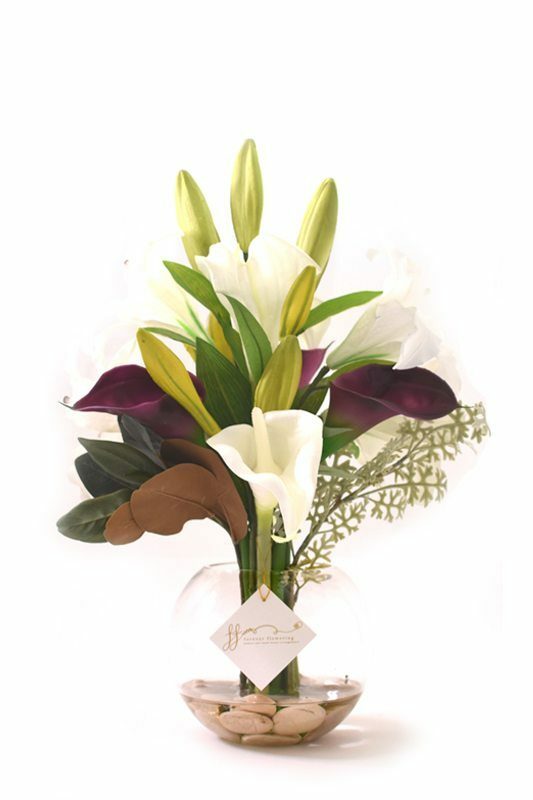 Please note – the white Calla Lilies will eventually discolour due to oxidation. Fake flowers, artificial flowers or silk flowers – whatever you call them, there’s nothing better than a flower arrangement that requires no maintenance or upkeep yet lasts forever! All of our floral arrangements, plants and succulents are made of the highest quality and most realistic artificial flowers, in both look and feel. 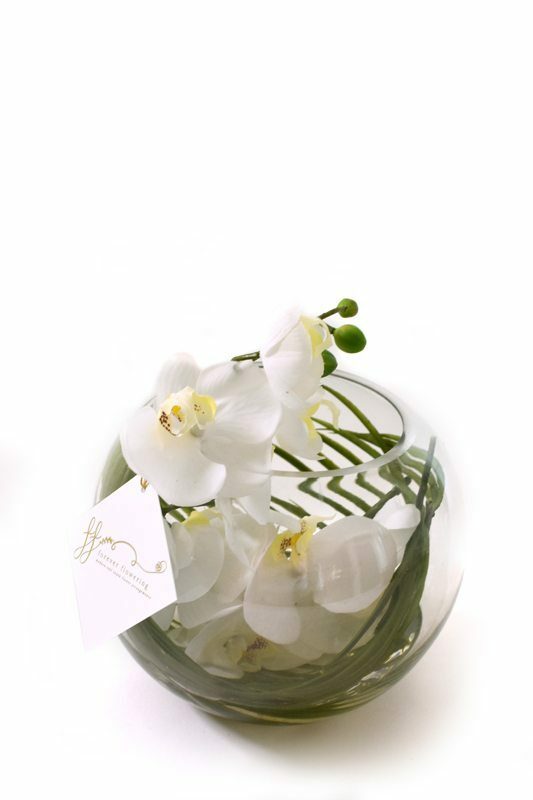 We take great pride in sourcing only the very best, real touch flowers. Our flower arrangements are perfect as table centrepieces in your hallway, for the wedding table and decorating your home or office. Flowers are also one of the most well received presents you can give. Why not gift a gorgeous bouquet to a friend or family member? With so many to choose from, they are perfect for every special occasion such as birthdays, Christmas, weddings, anniversaries, engagements, sympathy and thank you. At Forever Flowering, we are continuously looking for new and innovative products to enhance our next collection. If you have an idea that you haven’t seen, we would love to hear from you! Please note, as our flower arrangements are handmade there may be slight variation to the product images shown. All arrangements are made to order and require a 2-3 week processing time frame. Thinking of Mismatching Your Bridesmaids’ Bouquets? 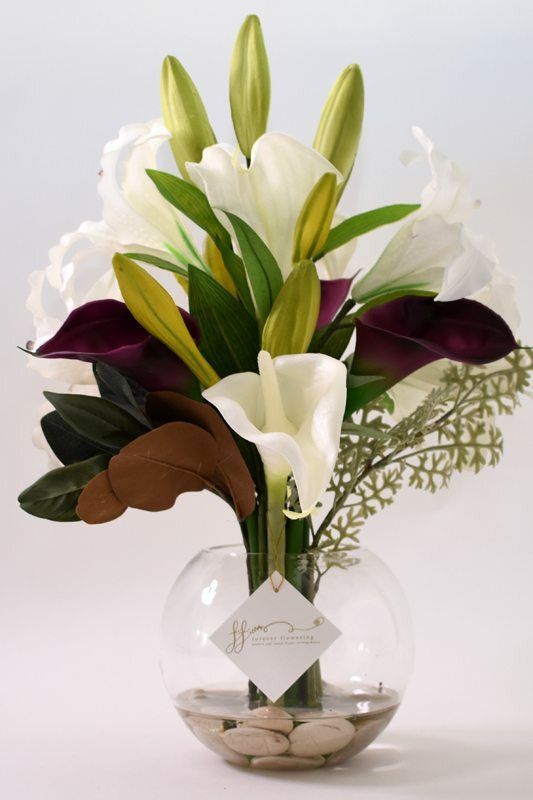 We might sell fake flower arrangements but we guarantee they are Australia’s longest lasting gift! Our artificial flowers are perfect for all occasions – weddings, engagements, birthdays, sympathy or friends – these are lifetime gifts that last forever, set in no fuss artificial water!